The enveloped arrived today that contains membership materials, aka subscriber benefits, for SF . Opera's 2017-18 season. Under the list for Medallion Society members, I saw "Complimentary ticket exchange" and my eyes got wide. Ticket exchanges have been free for subscribers more or less forever, and SFO has had extremely reasonable ticket exchange policies for as long as I have tracked this issue. One benefit is completely gone that I wish had continued: the ability to swap to a better seat in a different section on the day of the performance. Oh, well. "Cuts? What do you mean, cuts? You cannot cut this opera!" Actually Susan Graham (Didon) threatening the departing Brandon Jovanovich (Eneé) in Act V.
You knew there would be some, right? Even in the context of a superbly performed and well-directed Troyens? Here I go. To the ceremonial music in Act 1; the particular section cut is where Berlioz specifies something like Greek games, which would have been a religious observance. (That is not how it was done in SF; this was the section with children running around and playing Ring Around the Rosie.) H/T Rob Gordon for identifying the cut; I thought something had gone missing in Act I, but wasn't sure what. All of the Act III ballet music surrounded by the chorus "Gloire a Didon," which totally jammed together the different versions of the chorus and buried the dances for the baker, the farmer, the builder, etc. Musically, this is a very damaging cut, plus it removes much of the justification for "Gloire a Didon" and the awards she makes to the different professions. We have to see what she has done for the city, which has only existed for seven years. Two of the three ballet sequences in act IV before the quintet / septet / love duet, one of which provides the only upbeat music in the act other than the Royal Hunt & Storm at the very top of the act. Again H/T to Rob, for the specific cut and for noting the musical reason for keeping the contrasting dance music. They may have cut one verse of Iopas's song "O blonde Ceres" in Act IV. I wasn't counting but Rob was and thinks there might have been a cut here. The two-minute scene in act V with the two Trojan sentries who really don't want to leave Carthage and their compliant mistresses. This one is defensible on no grounds whatsoever. It is short; it can be done by good local singers (Adler Fellows in SF, should have been done by the equivalents, Ryan Center singers, at LOC); it provides the only humor in a long and often-grim score; it was Berlioz's nod to Shakespeare, one of his great heroes, along with Gluck and Virgil. The ballets they retained (the Royal Hunt and the single sequence later in Act IV) were much better danced than in SF. My stance about cuts is mostly that composers knew what they wanted and why. * In the talk-backs after the performances, Anthony Freund, the general director of LOC, tried to defend these, but I wasn't buying what he said. 1) "Cuts in opera are always controversial" (yes - with good reason) 2) "We had to bring it in under 5 hours" (SF did this by omitting repeats in the ballet music and, I think, the second verse of "Inutile regrets".) 3) "The director and conductor agreed that these scenes didn't advance the story and could safely be cut." Well, okay, maybe they do know better than Berlioz, but I don't believe that for a minute. It is really obvious that most of the cuts were to avoid paying for dancers and a lot of ballet rehearsal time. Cutting "O blonde Ceres" and the sentry scene saved them no more than five minutes of performance time and two inexpensive singers. I also want to mention a few bits here and there in the operatic repertory that don't exactly advance the plot, but there would be justified howls of outrage if they were cut. The Norn scene in Götterdämmerung. This was a routine cut at the Met before World War I, I believe. Also in Götterdämmerung, the short scene before the Immolation where Gutrune, wandering alone around Gibichung Hall, hear's Siegfried's horse whinny and has a premonition of what has happened. From something in John Culshaw's Ring Resounding, I think this was also a routine cut before the 1960s, except at Bayreuth. The Ride of the Valkyries. I mean, does it advance the plot? No, but it sets up the rest of the act nicely. "Vallon sonore," at the very top of Act V of Les Troyens. It doesn't advance the plot, but it does set up the sentry scene, providing a melancholy contrast to the sentries. You really can't cut this, though - can you imagine launching the act with the Trojans eagerly chatting about how Enée has finally decided it's time to leave? It's a moment of wistful repose before an emotionally fraught act. (Cassandre) way up at the top of the set, far right. This is from the opening scene of the opera. More than two nine months late, but what the hey. I'd like to get this report in print for posterity. It is less a review than what I would tell a friend who hadn't been there, so um it's a lot longer than any of my published reviews. I am one lucky opera-goer, to have seen this great opera two years in a row, in very different productions. I reviewed the SFO production for SFO, I saw it 3.5 times, and pace the late Bob Commanday, I am going to make comparisons between the two. 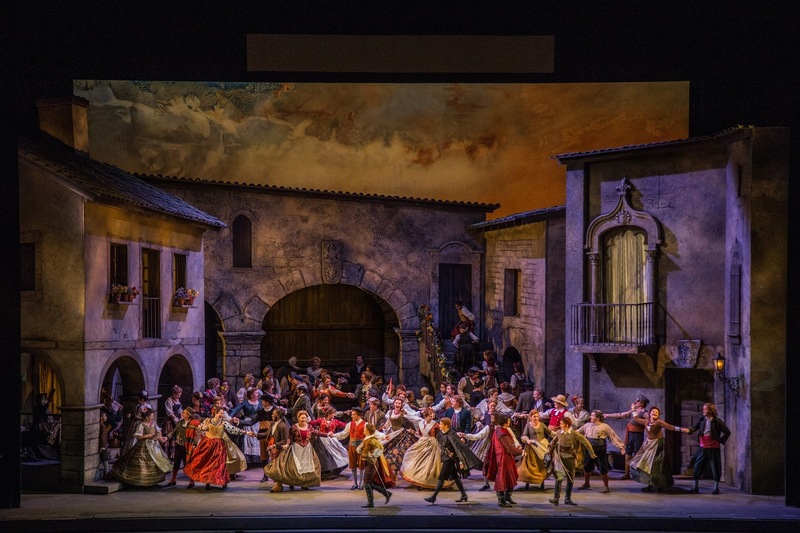 The production differences illuminate some significant points about the opera. It is a huge piece with a large cast and, from all reports, a real bear to stage. Albery and Lyric Opera went with a fairly austere physical production in the form of a pair of unit sets, one for Troy and one for Carthage, that were built along similar lines. The costumes were not handmade, but mostly off-the-shelf modern outfits, with credits given in the program. This makes a lot of sense, considering that LOC doesn't have a co-producing house and bore all of the costs on its own. 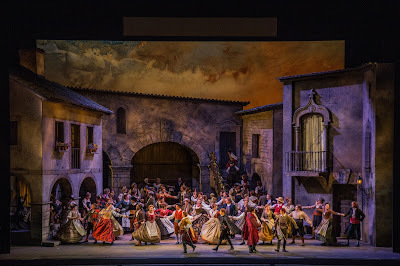 For the more elaborate McVicar set and costumes, the costs were split up among the Royal Opera, San Francisco Opera, La Scala, and the Wiener Staatsopera. Yeah, I'm sure it's costly to ship those 20 containers of sets and scenery around the world, but in total it's gotta be a whole lot cheaper for each house than rolling its own Troyens. In the photo at the top of this post, you can see one side of LOC's Troy set, consisting of a tall curved wall with an irregular semicircular opening at the base and with a pile of rubble to the right. The Carthage set was nearly identical, except there was no rubble, and in addition to the cut in the base, the set was equipped with some movable elements that opened and closed, providing entry points for the Trojans' first appearance, Didon's entrance toward the end of the opera, and others. Lyric Opera's press photos don't include photos of both sets in their various configurations, or I'd put them right here. Both sets could be reversed, so that each location could have both concave and convex views of the set. Further, the production makes excellent use of the stage turntable, so that you often saw the set revolving during a scene. At the very opening of the opera, before the music starts, you see a worried-looking Cassandre looking through a cutout high in the set overlooking the giant wall; as it revolved, you saw the chorus come out for the opening and heard the music starting up. This was mirrored at the opening of the very last act, where the young sailor Hylas sang "Vallon Sonore" from a parallel cutout in the Carthage set. The cutout at the base gets used in various ways as well. Here's the Act II scene where the ghost of Hector tells Enée to get out of dodge and head for Italy; you can see the flames of the burning city of Troy projected onto the set. So you might be wondering about the horse. 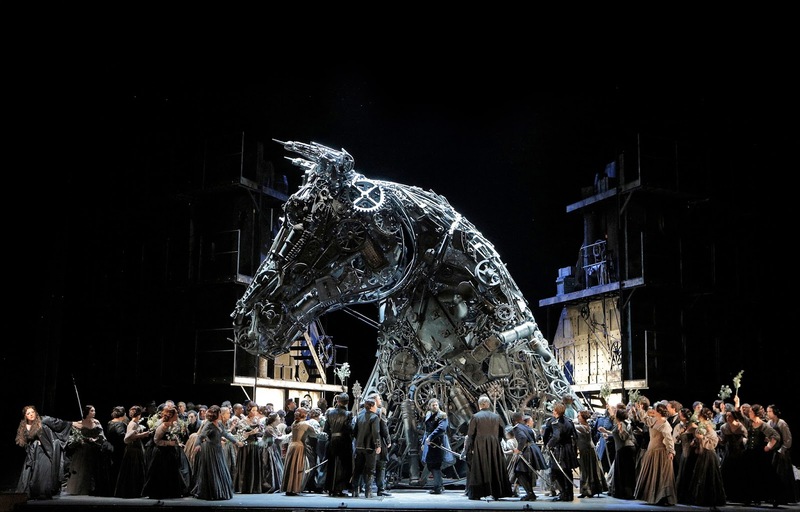 If you saw the SFO production, you know that the McVicar has a 25-foot-tall horse - okay, a horse's head - that makes an utterly terrifying first appearance and then bursts into flames toward the end of the Troy scenes. I like spectacle as much as the next person, and hey, maybe Berlioz would have liked this. He did write a rather elaborate and spectacular scenario for the Royal Hunt and Storm! But it seems pretty clear from the libretto that he did not expect to have a Trojan horse on stage: instead, the chorus and Cassandre narrate the horse's appearance and movements through the city. LOC handled this with a fabulous projection of the horse on the convex side of the set; the chorus was stationed on a narrow bit of the stage between the set and the orchestra pit, and oh man, they were fantastic in this scene, and very, very loud. No photo, alas! One of the most beautiful and effective parts of McVicar's staging was the long ceremonial scene in Act I, where King Priam and Queen Hecuba appear, and Andromache, Hector's widow, pays respects to the fallen Trojans with her young son. SFO doesn't have a photo of this scene for press use, but I can tell you that the set opened up and a long procession came through and then the nobles arrayed themselves on stage. Andromache was played by a dancer - it's a non-singing role - and she was magnificently eloquent. This is one scene where Albery made a huge mistake. That the scene was less impressively staged overall isn't the big mistake, though the comparative informality of everyone's appearance made it less impressive than it could be. No, the mistake is that when everyone has entered, King Priam washes the feet of a Trojan soldier, which was described in the talk-back after the opera as an act of humility. Introducing an element so strongly associated with Christianity into this pre-Christian and Greek-religion-oriented opera is simply wrong, striking very much the wrong note. On the other hand, there's a scene toward the very end of the opera that McVicar got wrong and Albery got right, and that's Didon's long scene when she knows that Enée has left and also that she is going to commit suicide. The McVicar production plays the previous scene, with Narbal and Anna, in front of a plain black drop curtain, at the front of the stage, exclusively to accommodate a scene change for the ceremony with the people of Carthage, Didon's final scene and suicide, and the very last chorus. It could have been done on the regular Carthage set, and that would have been much better than what we got. Albery plays this scene out on the first Carthage set, which is austere but has a raised platform from which Didon sings both at the opening of the Carthage scenes and now at the end. His staging was amazingly well done; very simple and straightforward, but also so effective that at the second performance, even though I knew perfectly well what was coming, I was surprised when Didon committed suicide. That's a good staging. There were also fantastic horrified reactions from Christian Van Horn (Narbal) and Okka von der Damerau (Anna). Noting here that Graham's outfits got less modern and more Greek as the opera progressed. And on to the cast, which I would say was on par with the SFO cast, with different strengths, because with two exceptions, we had very different casts. The exceptions, of course, were Susan Graham as Didon, a late substitution for Sophie Koch, who withdrew from the production, and Christian Van Horn as Narbal. Narbal's role as Didon's prime minister or chief of staff (or something like that) was far clearer in this production than in the McVicar, where I feel that Narbal just spent a lot of time standing around. The costuming helped; there was a real distinction between the government (Narbal, Didon, Anna) and the citizens (chorus, not dressed in formal officewear). In SF, everybody wore beautiful robes that didn't distinguish much among the social classes. Van Horn sounded even better than in SF. Graham gave a performance the dramatic equal of her SF performance, nobly acted and well sung, and yet....I feel that she is a bit underpowered for this part. She has said herself in an interview that her training and the roles she has accepted are mostly for high mezzo - no Carmen for her - and that this was a deliberate choice on her part. So she cannot quite muster as much power as one might want when she is raging at Enée and awaiting her own death, because this is in her lower register. Still, this is about the only flaw I can find. In the more lyrical parts of the opera, she was marvelous, particularly in the long and beautiful ensembles of Act IV and the love duet. Act IV; May I say that I love her dress and want to buy a copy? Speaking of distinctions, in SF Sasha Cooke, singing Anna, really did sound a great deal like Graham, so it was easy to hear them as sisters. Still, the score calls for a contralto for the part, and Okka von der Damerau, while not a contralto, does have a darker-toned voice than Graham or Cooke, so there was more vocal contrast. Probably as a result of Albery's direction, Anna's scheming to get Didon together with that handsome young Trojan was more to the fore than in SF, and she certainly came off as more Machiavellian. Von der Damerau is an excellent singer and I hope she'll get more work in the US. Act I, as everything is falling apart. Brandon Jovanovich, making his role debut as Enée, sang the role very, very well, handling Enée's impossible entry in Act I with aplomb and sounding good even when suffering from a slight cold in the second of the performances I saw. (I understand that he missed one performance, and Corey Bix sang it.) He was especially good in the most lyrical moments and very tender in the scenes with Ascanius, Enée's son. (He has two young sons and commented on this during one of the post-performance talk-backs.) He doesn't have quite the amazing high notes of Bryan Hymel, who also is more dashing on stage, but that is okay! Jovanovich is handsome, moves well, and generally cuts a good figure. It is a long and difficult role, and I would be very happy to see him sing it again. And, of course, Goerke has about twice as much voice as Antonacci, and put it to good use. She also has perhaps the most beautiful dramatic soprano voice currently to be heard, and is a tremendous actor. So we saw a truly complete assumption of the role in every way. I liked Lucas Meachem a whole lot as Chorebe. I had just seen him as Dr. Malatesta in Don Pasquale, a slight thing. He was a strongly masculine Chorebe, a bit more rough-hewn than Biran Mulligan in SF, and that was exactly right for this production and for his relationship with Goerke's Cassandre. Annie Rosen was a lovely Ascanius, younger and shyer than Nian Wang's leggy teen in SF. Act IV, "O blonde Ceres"
Albery's production had Iopas on stage as the royal chorus master; he conducted the chorus in "Gloire a Didon" as well as singing "O blonde Ceres" in Act IV. Mingjei Lie, a fellow at LOC's Ryan Center (the equivalent of SFO's Adler program) sang and acted perfectly well, but, well, it was luxury casting to have Rene Barbera in SF. Similarly, Jonathan Johnson was a good Hylas, without quite having the beautiful sound of SF's Chong Wang. All other roles were ably handled; surprisingly, the best French in the cast came from Bradley Smoak, whose brief appearances as the Ghost of Hector were memorably haunting. The LOC Chorus worked their share of miracles in this piece. What a terrific group! Their sound was huge and beautiful, and I believe they were more precise than the SFO chorus. That's saying a lot: the SFO chorus was pretty great in this work, which has an enormous amount of choral music. I thought Andrew Davis pretty great, although there was something not quite right in the Troy scenes of the first performance, when for some reason the orchestra seemed less present than it ought to have been. Whatever was going on, they were fine in the second performance. Davis handled the huge forces with plenty of authority and gave the piece the special grandeur that it needs. The orchestra was mostly excellent, perhaps the horns are not as good as SFO's; I thought there were some discontinuities in the Royal Hunt & Storm's big solos, and for some reason it sure sounded as though the principal horn was in the pit rather than offstage. Now, it's not as though this was a perfect production. There were cuts, some of them, imo, unnecessary. I've got another post coming up on them. All around, it was a satisfying production of a great piece, well performed and certainly very well worth traveling for. Photo by me even though you're not supposed to take photos inside the theater. 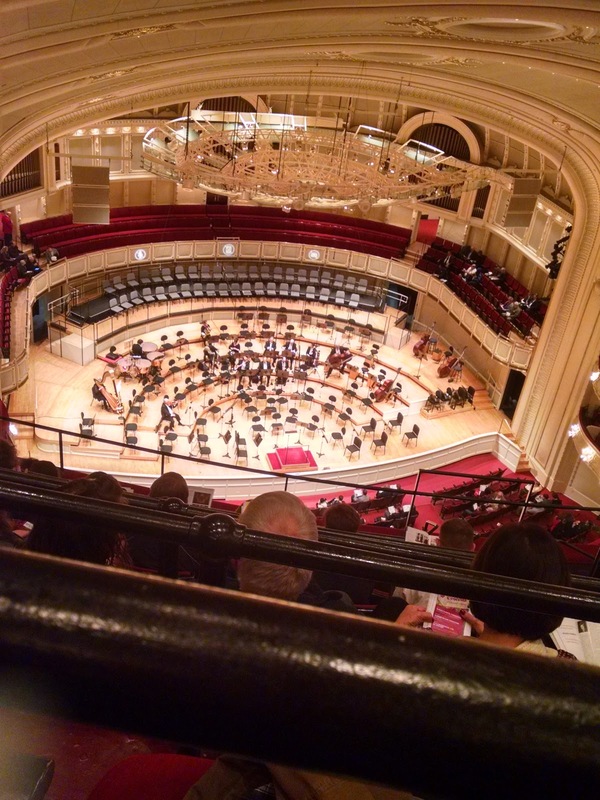 I saw a couple of performances in Chicago that were not of music by Hector Berlioz, one at the Chicago Symphony and the other at Lyric Opera. I've got a review coming out of van Zweden's recording of Das Rheingold one of these days - or maybe it is out already and sitting in the mail pile [it is long since published!] - and you could say I was not happy with it. Never mind the mediocre sound engineers, the extreme variability of the cast, and an orchestra that he's welcome to call great (but I won't): this is a remarkably dull Rheingold, which is about the worst you can say about any performance of anything. Now, maybe I should have sprung for a more expensive seat. I was way the hell up in the top-level balcony, which is approximately three thousand feet from the orchestra, a steep and terrifying three thousand feet - but the box office had said the area had the best sound in the house except for the much more expensive seats a couple of levels down. Considering the cost of my Troyens tickets, yes, I certainly should have gotten the more expensive seat, especially since the seats up at the top of Orchestra Hall are horribly uncomfortable, much much worse than the seats at Bayreuth, because they are tiny, there is absolutely no legroom, and you're more or less on top of your neighbors and the people in the next row down on a very steeply rake. You bet I hung onto the rails in front of me for dear life going to and from my seat. And I wondered how the much older woman seated near me managed the stairs. Yeah, maybe the orchestra and JvZ would have sounded better from lower down. Or maybe not. At least my back would not have hurt when I got out of the concert. I also took in the first performance of Massenet's Don Quichotte at LOC. Henson Keyes wrote a very positive review for Parterre Box. He's right that the performers were very, very good - although unlike Keyes, I sure hear some wobble in Furlanetto's bass - and the production is very pretty and Andrew Davis conducted well. Let me just say that the only reason to perform this opera is if you've got charismatic performers for the three main leads, because, honestly, it's not really a very good piece. Sure, it's pretty; sure, there are a few extractable arias. Yes, I'd like to hear Clementine Margaine is something more substantial; she's got a spicy and very interesting mezzo and good dramatic presence. But overall? It's just a lot of unmemorable prettiness, like Andrea Chenier and Alfano's Cyrano. 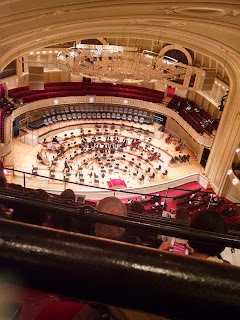 The next few posts I publish are going to be very very chronologically disjointed: they're the three posts I wrote, or started to write, after last November's trip to Chicago for a pair of, ah, very different 19th c. French operas: Massenet's Don Quichotte, which is a trifle next to Berlioz's mightly Les Troyens, the greatest of them all. Why have I been sitting on them? I....can't remember. The Troyens post is not quite finished, so it may not turn up until tomorrow. Why am I publishing them now? Because I might as well get them published before Elektra, starring Christine Goerke, opens in two weeks. Big thanks to Lyric Opera of Chicago, for giving me access to the press photos for both operas! And let me say that my friend Brian was absolutely right when he told me that the Civic Opera House is the most beautiful in the US. It is glorious and it also has big, comfortable seats and fine acoustics, better than the War Memorial Opera House, imo. Free Class: Sign Up Now! To sign up or ask questions, contact me by leaving a comment, sending email to sensei@opendoorjujitsu.com, or calling the dojo at 510-842-6243. Please feel free to circulate this information to anyone who might be interested! It's that time of year again: the second winner of the Jan Shrem and Maria Manetti Shrem Emerging Stars Popularity Competition has been announced: it's Arturo Chacón-Cruz, who sang an okay, not great Rodolfo in the June run of La Bohème. And once again, why, exactly, is Chacón-Cruz an emerging artist? He has previously sung only the Duke of Mantua at SFO, and that was five years ago, but Operabase shows a tenor who emerged a long time ago: He has been singing leading roles at important European and US opera houses since 2006, that is, eleven years. I'm not a fan of contests decided by audience voting, but this competition could be made more credible by placing time limits on debuts in major roles or something like that. SAN FRANCISCO, CA (August 15, 2017) — San Francisco Opera announced today a casting update for its season-opening production of Giacomo Puccini’s Turandot, running from September 8 through 30 at the War Memorial Opera House. American soprano Toni Marie Palmertree will sing Liù, replacing Maria Agresta who has withdrawn due to illness. Originally scheduled to portray Puccini’s tragic heroine on September 24 and 30, Palmertree will now perform in all six September performances. Palmertree scored a triumph last season when she substituted for an ailing colleague on two hours’ notice as Cio-Cio-San in Puccini’sMadama Butterfly. The occasion marked her first time portraying the character on stage and her first leading role with the Company. San Francisco Classical Voice remarked: “The young soprano not only met the challenge, but she claimed her place among the finest vocal interpreters of the role heard here recently.” Currently in her second year of a San Francisco Opera Adler Fellowship, Palmertree has sung the Priestess in Verdi’s Aida, the Heavenly Voice in Don Carlo and appeared in Company productions of Jenůfa and Dream of the Red Chamber. She recently starred in West Bay Opera’s production of Puccini’s Il Trittico, portraying Giorgetta in Il Tabarro and the title role in Suor Angelica. San Francisco Opera inaugurates its 95th season on Friday, September 8, with Puccini’s Turandot, staged in the iconic production by English artist David Hockney and conducted by Company Music Director Nicola Luisotti, and two opening night galas. Saturday, September 9 features the opening of a new production of Richard Strauss’ Elektra. The festivities continue on Sunday, September 10, withSan Francisco Chronicle Presents Opera in the Park, an annual Bay Area tradition celebrating the opening of the opera season with a free concert in Golden Gate Park. Puccini’s 1926 masterpiece is set in fabled Peking and follows the courtship of a beautiful and untouchable princess by a mysterious stranger who must triumph in a deadly game of riddles to win her love. The opera is renowned for its powerful choruses and extraordinary vocal highlights, including Turandot’s commanding “In questa reggia” (“In this palace”), Liù’s dramatic death scene and Calaf’s famous Act III aria, “Nessun dorma” (“No one sleeps”). Left unfinished at the time of Puccini’s death, Turandot was completed by Italian composer Franco Alfano and had one of the 20th century’s most spectacular operatic premieres. An internationally acclaimed artist who is known for a diverse repertory of roles, Martina Serafin returns to the War Memorial Opera House stage in one her most celebrated portrayals as Princess Turandot. This season, the Austrian soprano also performs Turandot at the Metropolitan Opera and Opernhaus Zürich; Abigaille in Verdi’s Nabucco at Milan’s Teatro alla Scala; and the title role of Tosca at London’s Royal Opera, Covent Garden. Serafin made her San Francisco Opera debut in 2007 as the Marschallin in Richard Strauss’ Der Rosenkavalier. The photos I have don't begin to do the location justice. Don't panic: it's not Christine Goerke. Stephanie Blythe won't be making her role debut as Klytemnestra next month after all; she has withdrawn "for personal reasons." Rehearsals are starting this week; I hope Ms. Blythe is well and that it's just a matter of "maybe this role isn't for me after all," a decision any singer can make. Stepping into the part is Michaela Martens, who sang Cassandre in one performance of Les Troyens two years ago and did a good job with it. SAN FRANCISCO, CA (August 7, 2017) — San Francisco Opera announced today a cast change for Richard Strauss’ Elektra, which opens on Saturday, September 9, in English director Keith Warner’s new staging at the War Memorial Opera House. American mezzo-soprano Michaela Martens will sing the role of Klytemnestra, replacing mezzo-soprano Stephanie Blythe who has withdrawn from the production for personal reasons. Martens made her 2015 San Francisco Opera debut as Cassandre in Berlioz’s towering Trojan War epic,Les Troyens. She returns to the Company to sing her first performances of another demanding operatic role, Klytemnestra, the murderous and guilt-ridden mother of Elektra in Strauss’ 1909 opera with a libretto by Hugo von Hofmannsthal based on the Greek tragedy by Sophocles. Known for her vivid portrayals of some of the most challenging mezzo-soprano roles in the repertory, Martens has performed on many of the world’s leading stages including the Metropolitan Opera, Munich’s Bavarian State Opera, Vienna State Opera, Grand Théâtre de Genève and English National Opera. Her other roles include Judith in Bartók’s Bluebeard’s Castle; Kostelnička in Janáček’s Jenůfa;Herodias in Strauss’ Salome; Ortrud in Wagner’s Lohengrin and Kundry in Parsifal. She will reprise her Klytemnestra with Houston Grand Opera in January 2018. Martens is a former Merola Opera Program participant, a past winner of the Metropolitan Opera National Council Auditions and holds a degree from The Juilliard School. 1. Alex Wellerstein's post at Restricted Data, ostensibly about a conference in Japan, that also discusses the situation with North Korea. Australia doesn't allow refugees who arrive by boat to enter their country. This is to discourage use of an extremely dangerous sea crossing to reach Australia. The US agreed to accept up to 1,250 refugees who arrived in Australia this way. These refugees are not in prison. The US can vet the 1,250 to our heart's content to make sure it's safe to admit them to the US. I think David Frum is right that it is very, very bad that a conversation between the US president and a world leader was leaked. What if it had been an Obama conversation when the Iran nuclear deal was being negotiated? But that conversation demonstrates the mental incapacity of the president to such an extent that you understand why it was leaked. 3. The possibility that the US will default on its debt, owing to the intransigence of a small number of our elected representatives in Congress. This could introduce another terrible worldwide recession, and there is no way that the current administration would respond effectively to it. It's not even clear that they think a default is a bad thing. Here's Paul Krugman adding to my anxiety.